I’m really the most public private person I know. I share a lot of my life on the internet, and tell perfect strangers I meet just about anything about myself with an open heart. At the same time I hate that I overshare. Thank you all for your comments, emails, phone calls, & tweets. We tried waiting as long as we could to share, but I just couldn’t hold the happiness any longer. We feel so blessed and loved. PhillyBoy and I talked about wanting kids early on. After only 3 or so months of dating we had a serious talk one night about where we would live if we got married, and it was understood that because of his career I would move to Philadelphia. In that same conversation we talked about babies. I always said I wanted a big family, and he felt the same. I was thrilled. We got married and enjoyed our new family as just the two of us (…plus our laptops ha!). After only 6 months of marriage I started feeling that indescribable pull to want to become a mother and have a child with the man I love so much. We still decided to wait since we had just started living in the same city 6 months prior. A few months later the topic came up again, and we decided we might be ready to officially grow our family. If you know anything about me, you know I’m a planner. I started researching and reading online, and I pretty much learned everything you need to know about TTC (please email me any questions!!). We got pregnant easily last summer, but sadly lost that pregnancy early on. The doctor asked us to wait three months after that to allow my body to heal, so we did. It was the longest three months of my life. Luckily and blessedly, after those three months we got pregnant again right away. After church one Sunday I just had this nagging feeling that I had to be pregnant, so I took a test. Even though they say to wait until morning. Even though it was too early to test. I started shaking and smiling and for a brief second thought about waiting to tell PB until I thought of some genius way to share. I couldn’t wait one minute. Just another typical PhillyBoy/RhodeyGirl conversation. The first couple of weeks I was a smug pregnant person… I ate my salads and veggies and silently mocked all the women who claimed they couldn’t touch a veggie for the entire first trimester. Little did I know that would come back to bite me around 8 weeks…..
You are so cute! I’m so glad that you are so happy to be starting a family:-) It is also really nice to hear that you got a 2nd chance. CONGRATULATIONS!!!!!!! I’m so happy for you!! Thank you for sharing the news with us. This entry is adorable and brings such a smile to my face. I’m so happy for you! 🙂 I think its fabulous that you are able to be so open and honest about all that you went through. If only I had the courage 😉 haha. You two are seriously going to be such great parents! Also? The taste for veggies might stay away the whole pregnancy. Just eat what sounds good to you! OH sweetie 🙂 .. How you told Phillyboy just makes me grin from ear to ear. 🙂 amazing. I’m so sorry about your loss last summer. I’m sure it had to be so incredibly difficult… but the big Man up there must have had a plan for you guys to wait a little longer. And i’m so happy for you <3 ok… back to emailing you. lol. Talk soon! That’s so exciting!! Congratulaions. Hope you have a wonderful pregnancy. Goosebumps! I got more goosebumps! In the end everything is meant to be and the baby growing inside of you is already the most beautiful, lovable baby in the world. I’m so excited for you two!! So exciting, take care of yourself. I’m new to your blog, but am SO excited to follow along in your journey 🙂 Can’t wait to hear what happened to your eating habits around week 8! I missed your previous post–congratulations! I’ve been wondering for a while if you were keeping this secret! how wonderful! I’m so excited for you!!! You guys are going to be amazing parents! I can’t wait to hear all about your pregnancy and how it’s going, congrats!! I love the excitement you have for this and life in general- it’s so cute! 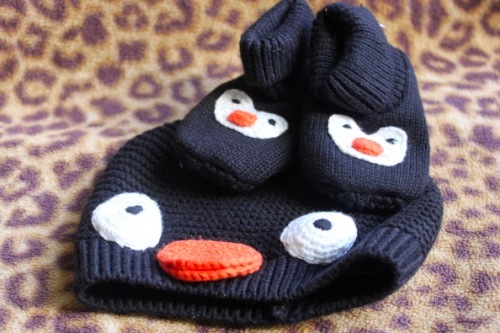 And the little penguin baby items totally melt my heart. Since I’m curious about all things pregnancy, I would love to hear how you are feeling, what you did differently (if anything) diet and workout-wise and what you are eating. I am so very happy that this happened for you and PB. 🙂 You are going to be a wonderful, thoughtful mom and PB will be a caring, fun dad. Congrats! I’m so happy for the 2 of you! I’m so happy for you two! I remember when you told us back in September at dinner before the Philly half marathon and wondered what happened. I’m happy things turned out positive in the end! Congratulations again! I’m loving the baby boom on food blogs all of a sudden. Congratulations, SO happy for you!! lovely story, can i really email you ttc question? If you are seeking any nutritional advice during pregnancy, please don’t hesitate to contact me so I can put you in touch with my mother who does this work. So happy for you too!! You guys will be the best parents. Two of the nicest people I have ever meet. So open, caring and loving!! congrats! your baby can play with my niece, who lives in philly too! Congrats! I am so happy for you! I look forward to reading your posts about pregnancy and motherhood! Enjoy this very exciting time! Congrats! We had a very similar experience (ok, actually like the exact same thing happened to us) when we were first TTC, and now we have a beautiful 2 year old little girl. Welcome to the club, mama! Can’t wait to see how you continue to cook & eat 🙂 as your family grows! Awww, that is so cute! I would love to hear more of the TTC stuff, so if you want to share it I’m all ears. I’m trying, and it’s harder than I thought it would be! Congratulations! I lost my first pregnancy five years ago (wow, hard to believe it was that long ago–in some ways it feels like yesterday) so I know how hard it can be. When that happened one of my friends told me I’d love the kids I did have all the more because of it, and two little boys later I can definitely say this is true! Good luck with the rest of your pregnancy. Omg I LOVE this. So cute!!!!! Love hearing the story. SO happy for your both!!! Long time reader and very rare commenter coming out of lurking to say Congratulations! I also wanted to thank you for sharing about your loss of your first baby. I know that is a very difficult thing to endure as I am going through the same thing myself. Your story gave me a little bit of hope for the future today. Thanks and Congrats again! Congrats!!! This made me tear up like nobody’s biznas. So happy for you guys!!! I’m also sorry to hear about the loss you went through last summer. What a blessing for you both to get pregnant so quickly. 🙂 Hope you are feeding the hunger monsta! Omg congrats again!! So happy for you guys, this post brought tears to my eyes. Where did you get those baby penguin accessories?! My hubby and I are obsessed with penguins and will adorn the baby room with a penguin/wildlife theme so I have to know where you got that! So cute!! !